I was always excited about Easter as a child, as are most children. When I reflect on my excitement, I think it was because of the spirit of Easter; the atmosphere that it generated because, although my mother always made sure I had a basket to find, my non-family, my father’s family, didn’t allow me to have one. My mother would fix up the top of the console TV as a “basket” of goodies for the household. She’d lay out the grass and place bunnies, chocolates, and other confectionaries scattered strategically about. For me though, I got my own little basket filled with all of her favorite candy. I laugh when I think about that. My mom was slick filling the basket with her favorites and not mine. I did not like cream filled eggs, chocolate covered marshmallow eggs, marshmallow peeps (the worst), or the jelly beans. Especially the black jelly beans; Mom’s all-time favorite (the worst of the worst). I didn’t care though, I was so happy to just have a basket. My non-family decided I was too old. Although, I do remember one year my step-mother making me a huge plastic cup full of candy for Easter. It too was filled with the sugar clumped jelly beans and cream filled eggs. Again, I did not care, I was appreciative, but mostly surprised. When my children came around, I changed things up a bit. For one thing, they were still getting baskets into their twenty’s. They were filled with candy, gifts, money, sometimes even gift certificates. They had to beg me to stop making them these enormous baskets every year. The other thing was the jelly beans. My mother-in-law introduced me to Jelly Bellies. Holy bunny eggs! I quickly became known amongst the kids in the neighborhood as “the mom who gives out the good jelly beans.” All of the kids would come “visit” so they could scope out the baskets and get some of the Jelly Bellies. There were four boys standing at the door just itching to get inside and go through my son’s Easter Basket. “So put up the basket or tell them they can‘t have anything yet,” I advised. Reese grabbed a few things and tossed them into the refrigerator for safe keeping. Later he told me he didn’t have time to go through and pick out all of his favorite jelly beans (Tutti-Fruitti) but he did keep watch. Jelly Belly makes gourmet jelly beans - each color is a different flavor. They have buttered popcorn, toasted marshmallow, even Dr Pepper flavored. The children often mixed and matched many of them. For example: taking a chocolate fudge bean and eating it with a peanut butter flavored bean to make a Reese’s Peanut Butter Cup. Jelly Belly even has a recipe card for mixing and matching. I used to get plastic eggs and fill them with Jelly Bellies and M&M’s - the kids would go nuts over them with Jelly Bellies being their favorites. 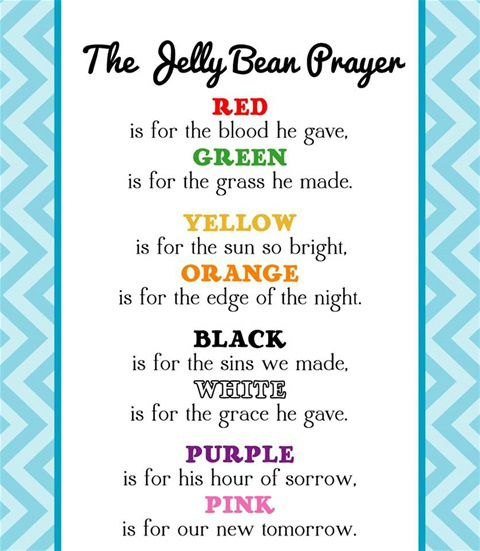 In the beginning, I would spend anywhere from $100 to $200 dollars at Easter just on jelly beans alone. They were a big hit. “When are you closing?” I asked while collecting my pile of jelly beans. “Me?” I asked somewhat surprised. Fortunately, I found another store that housed the Jelly Bellies. When they closed three years later, they did the same thing. They waited for me. They did not want to miss me before moving their store to a new location so, they waited for me to come in and get my jelly beans. “I’m going to use them all. There won’t be any left by the time Easter gets here,” I would answer. And so began the tradition. As Amber got older, and her little brother came along, so did a few of the neighborhood kids, friends, and family. My egg count grew from a dozen (12) dyed eggs to around 200 plastic eggs. Each plastic egg contained M&M’s, Jelly Bellies, and the special eggs had quarters in them. The first year we fenced in our yard so my dog, a black Chow-Chow named AJ, could roam it freely, we had a funny experience. My husband (the official Easter Bunny) was out hiding the eggs one morning when I noticed every time he would hide an egg, AJ would pick it up. She would follow behind him, gently put the egg in her mouth and then carry it to a pile she had started building. She was only trying to help! By the time Mr. Bunny had finished hiding all of the eggs, he had to turn around and hide all of AJ‘s eggs too. After that, we made sure she was in the house when we hid eggs. AJ could go out with the children when it came time for the hunt but remained inside while hiding them. Since Amber was her favorite human, AJ stayed close to her and helped Amber her find Easter Eggs. After all, the dog had experience in finding the eggs. Since my kids rarely, if ever, gorged themselves on candy, we often had lots left over once the baskets were cleaned out. We put the remaining candy in candy jars. I noticed if any Jelly Bellies were left over they were usually the first to get eaten from the jars. Whatever chocolate was left over at Halloween was usually discarded and thrown out. For my kids, it was more the sport of the holiday than it was the gain. My husband and I used to have so much candy for the kids. I am talking about hundreds of dollars' worth of chocolates, gifts, and at least 40 lbs. of jelly beans, if not more. We also made baskets for other children who were less fortunate and probably would not have gotten a visit from the Easter Bunny otherwise. Several would be trying the Jelly Bellies for the first time in their lives. Now in my latter years, my kids are grown and I’ve stopped making baskets. The memories remain and they are such fond ones too. I've had the best time with my children (and other children as well). Whenever I see the Jelly Belly heart or hear the name, I sigh heavily and smile. I love those Jelly Bellies and I love the fond memories the name gives me; all the years of making children, especially my own children, very happy at Easter.